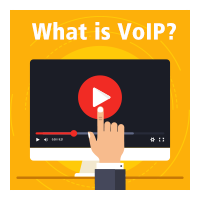 Since 30.1.0.7, our S-Series VoIP PBX supports SLA which maps the key with LED on a multi-line phone to different external lines. 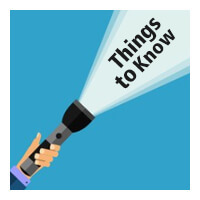 Shared Line Appearance (SLA) feature not only helps users share SIP trunks and FXO trunks but also helps monitor the status of the shared line. SLA feature works with BLF key on IP phones. When an incoming call is received, all the SLA stations are informed of it and may join it if the shared line allows to barge in. When an outgoing call is made by one SLA station, all members shared with the same line are informed about the call, and will be blocked from this line appearance until the line goes back to idle or the call is put on hold. 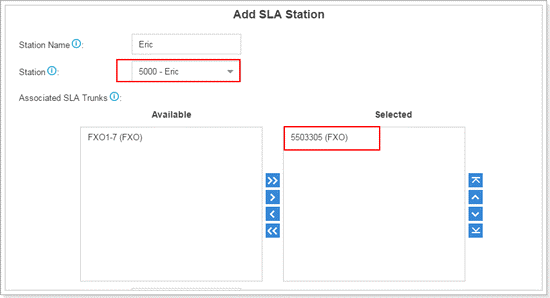 Enable SLA feature on a FXO trunk or VoIP trunk. Configure BLF keys for the shared line on the stations’IP phones. The BLF key value is “extension number_trunkname”. 1.Go to Settings > PBX > Trunks, edit the FXO trunk, check the option Enable SLA and configure SLA options. Allow Barge: check this option, the other SLA station shared the same line could press the BLF key to join the conversation. 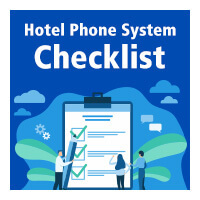 Hold Access: if set to open, other stations that share the line could retrieve the call; if set to private, the call can be retrieved only by the station that previously put the call on hold, not by others sharing the same line. 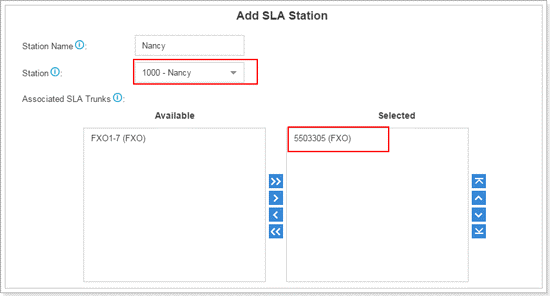 Go to Settings > PBX > Call Control > SLA to create SLA stations to monitor and share the FXO trunk 5503305. Here we create two stations, one for extension 5000, one for extension 1000. 2. Go to Settings > PBX > Call Control > SLA to create SLA stations to monitor and share the FXO trunk 5503305. Here we create two stations, one for extension 5000, one for extension 1000. 3. Configure BLF key on the boss’s IP phone (extension 5000). If the configuration is correct, you can see the BLF key LED is green. 4.Configure BLF key on the assistant’s IP phone (extension 1000). If the configuration is correct, you can see the BLF key LED is green. 5. All the configurations are done. You can enjoy the SLA feature now. If the BLF key shows the shared line is idle, the boss or the assistant could press the BLF key to use the line. After hearing a dial tone, he/she could dial the external number to call out. If the BLF key LED turns red, which indicates the line is in use now. The other SLA station could not use the line to make outgoing call now. When an external call reaches the shared line, all the SLA stations will ring. Any of the stations could pick up the call. When there is an active call between an SLA station and an external number through the shared line, other SLA stations could join the call by pressing the BLF key if “Allow Barge” is enabled for the shared line. During the call, the SLA station could press the BLF key to hold the call. If Hold Access is set to “private”, the call can be retrieved only by the station that previously put the call on hold.